We are a leading Manufacturer of fargo hdp retransfer film from Bengaluru, India. Being one of the trusted organizations in the market, we are affianced in providing a wide range of Fargo HDP Retransfer Film. Fargo HDP printers print your card image to an underside of 84053 HDP film. The film is then applied to the surface of the card, "sandwiching" the image between the film and the card. Fargo HDP card printers require specialized Fargo HDP film to function properly. HDP Film will be used along with YMC, YMCK, YMCKK HDP Ribbons. 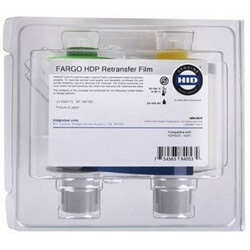 Looking for “Fargo HDP Retransfer Film”?